Faraway Press: The Online Home of John Jackson Miller: Star Wars: Kenobi cover released! 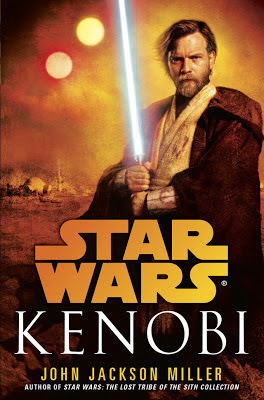 Thanks to IO9, we now have a look at the cover for Star Wars: Kenobi, which releases August 27! The Republic has fallen. Sith Lords rule the galaxy. Jedi Master Obi-Wan Kenobi has lost everything . . . Everything but hope. Click over to IO9 to see the cover in its full size. The cover artist is Chris McGrath, and the designer is Scott Biel. There's a preview of the book in the Star Wars: Crucible novel releasing in July. There'll be more interviews and such about the book as the summer goes along. In the meantime, I've written a little more about the book here. It's cool to see the cover at last! You can preorder the hardcover from Amazon, Barnes & Noble, Random House, and IndieBound. You can also preorder the audiobook from Amazon and Barnes & Noble. Also, don't forget to also look in on a couple of my current projects. The Star Wars: Lost Tribe of the Sith - Spiral graphic novel releases on June 19. The Star Wars: Knight Errant - Escape graphic novel is out now. I have a story in Simpsons Summer Shindig #7, out at the end of May. And currently running is Overdraft: The Orion Offensive, the fun science fiction serial I'm doing with 47North. $1.99 gets eight biweekly episodes, forming a complete novel; subscribe to get the three already released plus the new ones automatically downloaded to you as they're ready.